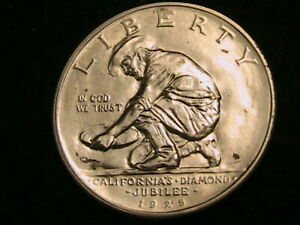 The discovery of gold in California in 1848 focused attention on that western territory as few other events ever could. The siren call of "riches for the taking" spread rapidly around the world. Tens of thousands caught "gold fever," braving the rigors of voyages "around the Horn," treks across Panama's deadly jungles or the time-consuming overland journey through hostile Indian territory. So many came in search of the yellow metal that by 1850, the "Forty-Niners" and those who followed them west numbered over 100,000 strong, a far cry from the fewer than 500 American traders and settlers who were in California just several years earlier. With the Treaty of Guadalupe Hidalgo in 1848, the Mexican War came to an end. Along with Texas and New Mexico, this newly-rich territory of California was ceded to the United States. In Congress, the question foremost on the minds of Southerners was how to preserve the delicate balance of power in the Senate if the now-populous California was admitted as a free state. But the flush of prosperity brought on by the eastward flow of gold ultimately proved a stronger force for unity in Congress than the spirit of disunity preached by the Southern "fire-eaters." An inspired solution was eventually reached: The Compromise of 1850. Under its provisions, California was admitted as a free state in exchange for popular sovereignty on the slave issue in the other western territories. This "Great Compromise" kept the states united for another decade, it but permanently tipped the scales of power in the Senate against the South. California remained relatively unaffected by the sectional rivalries of the 1850s and the ensuing Civil War. 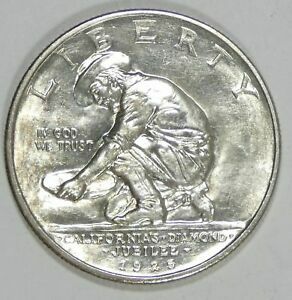 Seventy-five years later, the San Francisco Citizen's Committee, chaired by future mayor Angelo J. Rossi, decided to commemorate 75 years of statehood with a specially designed half dollar. Commemoratives, however, were already becoming a sore point with Mint officials. The proposal might have died aborning but for a similar measure undertaken on behalf of Vermont's Sesquicentennial that, fortunately, was endorsed by President Calvin Coolidge. 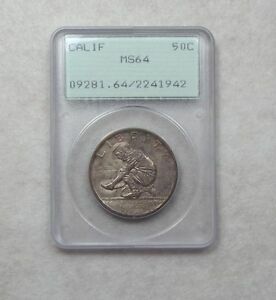 The California coin became part of the Act of February 24, 1925, which not only included a coin for Vermont, but one commemorating the 100th anniversary of the founding of Fort Vancouver in the state of Washington. 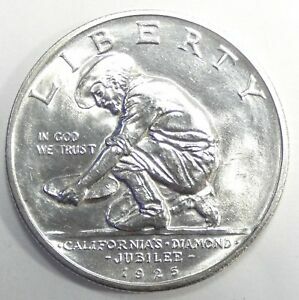 The San Francisco Citizen's Committee asked noted local sculptor Jo Mora to design a coin that would capture the spirit of the state's diamond jubilee. Born in Uruguay in 1876, Mora had emigrated to California and was a popular artist living in Carmel. 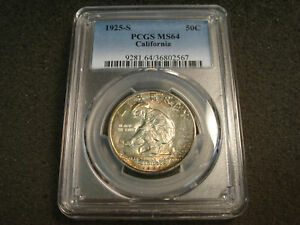 Fashioning both the obverse and reverse of the coin, Mora sought to embody the essence of California during the 1850s. He employed two symbolic motifs: a "Gold Rush" prospector and a grizzly bear. Initially, James Earle Fraser (designer of the Buffalo nickel), speaking for the Commission of Fine Arts, was opposed to Mora's design concepts, believing "the whole thing inexperienced and amateurish" and suggesting the Committee replace the artist. However, Chairman Rossi apparently had considerable political clout, as ultimately he and the Committee got exactly the coin they wanted by the artist of their choice. 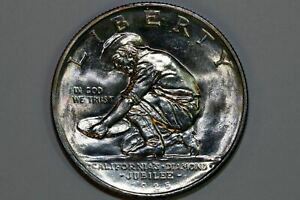 Mora's artistic obverse design depicts a "Forty-Niner" panning for gold, with the inscriptions LIBERTY above, IN GOD WE TRUST to the left and CALIFORNIA DIAMOND JUBILEE and the date, 1925, below. 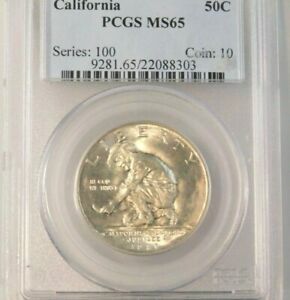 The reverse features California's state emblem: a grizzly bear adapted from the flag used in the so-called Bear Flag Revolt of 1846. 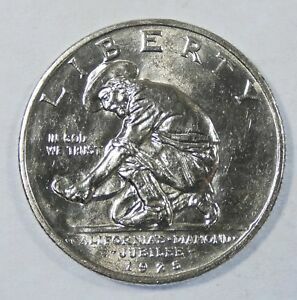 Above the bear is the motto E PLURIBUS UNUM, while below are the legends UNITED STATES OF AMERICA and HALF DOLLAR. Interestingly, the lettering is sized and placed in a manner that is particularly effective and not at all cluttered, altogether a skillfully artistic handling of the statutory legends. One point the Commission of Fine Arts made about the lettering was that the motto IN GOD WE TRUST looked as if it were being fried in oil, suspended as it was in the left obverse field above the miner's pan. As amusing and accurate as this comment was, the motto remained unchanged. 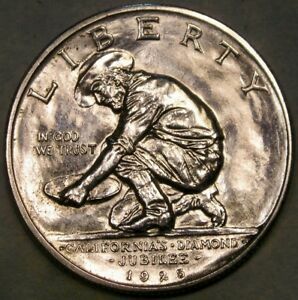 Mora added an interesting touch to the design of the California half: the fields were left unpolished, appearing as boldly textured on the finished coin as they did on the sculptor's model. 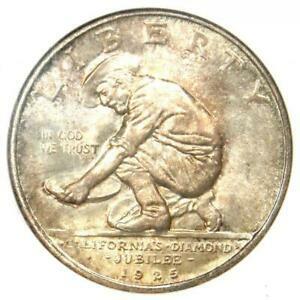 The Congressional Act authorizing the California Diamond Jubilee half dollar specified a maximum mintage of 300,000 coins, but only 150,200 coins were actually struck, with 200 pieces reserved for assay purposes. 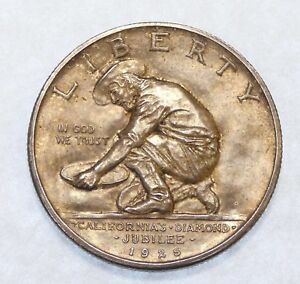 Production began at the San Francisco Mint on August 12, 1925, and that first day saw 100 special pieces struck at the request of Committee Chairman Rossi. These pieces are not true proofs, but rather are business strikes that have a bright, chrome-like surface, the result of being struck with polished dies. 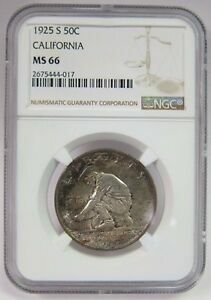 Groups in Los Angeles and San Francisco distributed the California halves for $1 apiece, but 63,606 pieces eventually remained unsold and were melted, leaving a net mintage of 86,394. Only one actual proof is rumored to exist, allegedly with a matte finish. 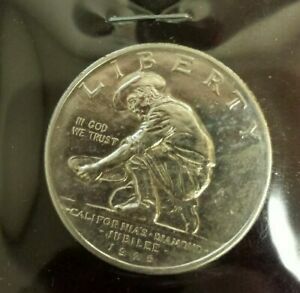 If true, it must have been struck at the Philadelphia Mint before the dies were shipped to the San Francisco facility. 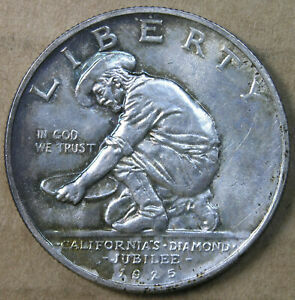 The S-mintmark appearing on all of the coins made at the western mint is on the lower reverse beneath the D in DOLLAR. 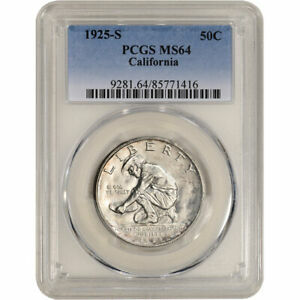 California halves are found with a wide variety of finishes, ranging from semi-prooflike to chrome-like to satiny. 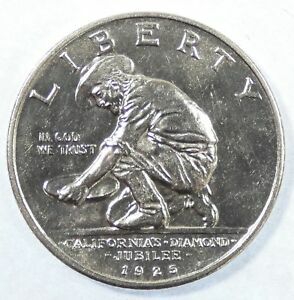 A limited number of early strikes may even feature somewhat frosted or cameo devices. Only a small percentage of this issue is affected by weak strikes, and those will often show a flatness on the bear's snout and possess a bright, chrome-like finish. 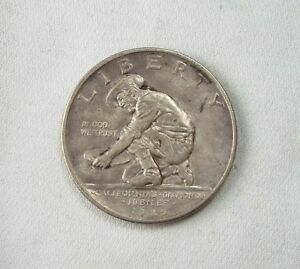 In other cases, weakness will be seen on the inscriptions LIBERTY, JUBILEE and HALF DOLLAR. However, this is not the norm. 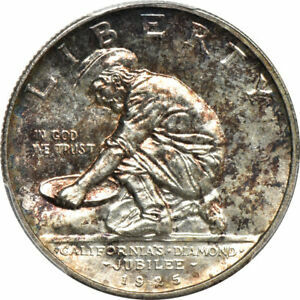 More frequently encountered are coins suffering from abrasions and detracting marks on the higher, more visible points. The relatively high relief of the design makes this issue especially prone to even the slightest friction, particularly on the bear's shoulder and leg and the miner's back, shoulder and shirtsleeve. These areas will also be the first to show signs of "doctoring." Because these coins were widely distributed to the non-collecting public, the majority of surviving specimens are in XF-AU, as many were either spent or carried as pocket pieces, while others were often haphazardly cleaned. 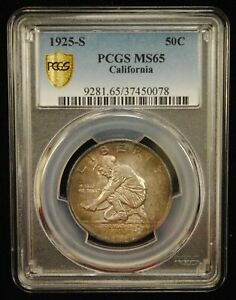 Low grade uncirculated pieces are always available for a price, but high grade MS 64 and better specimens are very elusive. 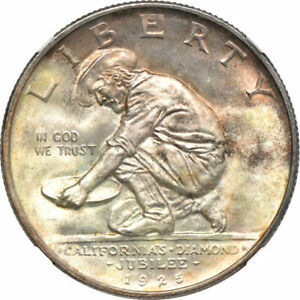 Counterfeits are not generally encountered, but cleaned and retoned coins are frequently seen. 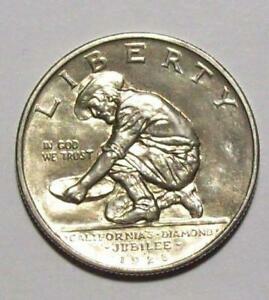 As a commemorative coin, the California Diamond Jubilee half dollar was a conspicuous success. Jo Mora's simple, two-figure design captured the spirit of 1850s California in a direct manner that few other commemorative issues can rival. By ignoring James Fraser and the Commission of Fine Arts, Chairman Rossi demonstrated that there was ample talent in the country capable of designing coinage outside the Mint. 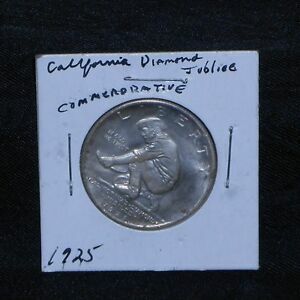 As a singularly artistic work and a necessary issue for collectors of the commemorative series, the California Diamond Jubilee half dollar will remain as coveted by numismatists of the future as it is by those of today.